v. : ; 29 cm. Submitted to U.S. Agency for International Development. Description based on: 1984; title from cover. (DAN-4099- A-00-2083-00) between USAID/Science and Technology and the University of Florida calling for support to AID Missions and related entities in the area of farming systems research and extension. The goal of this FSR/E project is to strengthen LDC agricultural research and extension programs in order to increase the productivity, income, and quality of life among small farmers in less-developed countries. The purpose of this project is to provide technical assistance to missions and LDC agricultural research and extension programs for the design, implementation, and evaluation of proj ects intended for the small or limited-resource farmer. Concurrently, it will build institutional capacity within those countries through training and networking. reviews of the plan have been held in each of the AID Regional Bureaus, AID/S&T and the FSSP support entity system. The working objective of the FSSP is to develop an interdisciplinary technology development delivery system (personnel and institutions of targeted developing countries and U.S.) capable of (1) assessing the constraints to food production; (2) identifying potentials to overcome such constraints in farming systems, and (3) generating and testing the effectiveness of alternatives that will enhance food production. constraints as the basis for development of appropriate technology. and manage farming systems projects. Project networking activities are intended to facilitate technical assistance and training in addressing these needs. various countries. This will entail budget reallocations and ability to locate the person within the region before January 1986.
training, technical assistance, and state-of-the-art activities planned for 1985. Details of (a) name; (b) location; (c) when; (d) rationale; (e) participants; (f) objectives; and (g) output (expected results) are provided in the attachment. countries facing similar problems in similar ecologies. increase the chances of success for the network. This should not be read to construe a disregard for Asia, the Near East and Latin America. The FSSP remains responsive to AID Mission requests from these regions and draws heavily on their farming systems experiences in an ongoing synthesis of the state-of-the-art. The experiences have much to offer to the evolution of the approach on the African continent, as well as to field practitioners. the ability to handle this demand will be equal to the funding that accompanies it. As soon as the Project Handbook revision is completed, FSSP will inform AID Missions and contractors of services available and in developing support activities in direct support of their needs. Team preparation through briefings, workshops, exchange visits and participant add ons (to ongoing work) is anticipated or requested by AID Missions in Rwanda, Burundi, Liberia, Mali, Sierra Leone, and the Gambia. At the outset of the Farming Systems Support Project, it became evident that the substantive base for support services was inadequate. This led to an emphasis on firming up the substantive base, following three lines of work. debriefing of technical assistance teams. and opportunities for research will be identified. FSSP provides needed elements for long-term institution building at low cost. FSSP is not a "bricks and mortar" activity but is a low-cost approach to badly needed training in research and extension. FSSP is attempting to improve research and extension communications among country programs. FSSP is providing access to the best people wherever they are (Asia, Latin America, Africa, U.S. and Europe) to address training needs. initiatives of the project, the Workplan offers a strategy for implementation for 1985. Each of the interventions scheduled represents considerable foresight and planning during the past year. They represent initiatives that have been taken on the part of AID Missions, national programs, International Agricultural Research Centers, field practitioners, FSSP core staff and others who have identified a problem and have been working toward the resolution of that problem. OBJECTIVE: Establish a regional sub-network on livestock and FSR/E. SPONSOR: FSSP, USAID/Togo in collaboration with IDRC. Togo, Burkina, Niger, Mali, Senegal, Gambia, Sierra Leone. 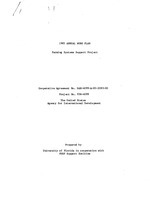 EXPECTED RESULTS: Determine livestock systems technical assistance and training needs for 1985. Schedule exchange visits to research sites for 1985. Schedule meeting for one year hence around research plans. Identify representatives to attend ILCA June 1985 workshop on livestock and farming systems. ridges etc.) and consider applicability for semi-arid West Africa. EXPECTED RESULTS: Establish peer interaction around research problems and results from FSU activities. Determine potential and needs for continued annual research reporting and review networkshop. Provide workshop summary results to participants and others in comparable ecological zones. Publication of papers presented (English and French). agricultural production and rural development of participating countries. SPONSOR: CIMMYT, Egerton College, FSSP. (CIMMYT sponsorship) and West and Central Africa (10 sponsored by FSSP). EXPECTED RESULTS: Identify pertinent common research and training needs. Discuss common production constraints for purpose of research planning. Discuss training constraints to discipline and farming systems research. identification of research priorities. Focus on research extension linkages for improved results for FSR/E. Discuss and evaluate francophone anglophone FSR approaches/experiences in West Africa. SPONSOR: USAID/Cameroon supported by FSSP. EXPECTED RESULTS: Strengthen research planning in context of Cameroon movement to integrating research extension and education. Identify potential Cameroon research linkages to West Africa. capability. (Specific workshop, agenda and objective to emerge from 4/17-4/19 planning visit.) SPONSOR: USAID/Gambia and FSSP. CLIENTELE: Gambian research, extension and planning personnel. First field use of new FSSP training unit on design and analysis of on-farm trials. OBJECTIVE: Increase practitioner competency in on-farm research. Provide participants an opportunity to share experience in design and implementation of on farm research. EXPECTED RESULTS' Intensified sharing of methodological and cropping systems research results within country that would contribute to increased commodity research effectiveness. Stronger team interaction in design of trials on crop production constraints within the context of the total farm unit. contract and NCRE (Specific objectives to be set by IITA). SPONSOR: IITA with support from FSSP. EXPECTED RESULTS: Improved technical assistance and team interaction in problem solving for cropping systems research. Improved adaptive linkages between stations/center and on-farm research. State University/USAID bilateral contract team. EXPECTED RESULTS: Team building with clientele group to accelerate and focus activity under the technical assistance project. Some constraint identification within target area (farming systems) to accelerate joint (national and technical assistance team) on-farm production research. Strengthen the collaboration in proj ect execution between CATIE and other national and international institutions. Colombia, Costa Rica, El Salvador, Guatemala, Honduras, Nicaragua, Dominican Republic; and representation of several international research centers and donor institutions. methodology and management within national institutions. Illustrate alternative methodologies and institutional structures associated with the FSR approach. Research Proj ect (JFSRP) to the FSRD approach and to develop in them a basic understanding of its concepts and procedures. SPONSOR: IDRC, IICA, FSSP, USAID/Jamaica, Ministry of Agric. EXPECTED RESULTS: Development of a research strategy for the JFSRP. Field use of FSSP training units. where the RTP is active. personnel) will be able to develop work plans from their region. Identify modes for cooperative efforts and collaborative financing for delivery of FSSP support. The FSR methodology evaluation team (in the country at the same time, finishing its work) presents its recommendations. institutions related to the RTP. EXPECTED RESULTS: RTP director and personnel will be well versed in the preparation of action plans using FSR. up, to the FSR/E approach. secretaries for natural resources, production and marketing, and research, extension and training; and other key administration. EXPECTED RESULTS: Working paper on how best to introduce FSR/E to the Dominican setting, beginning with either the Ocoa or the Las Cuevas watershed. EXPECTED RESULTS: Recommendations to the RTP for implementing FSP approach. Philippines, and for Southeast Asia in general. Provide recommendations as to type of training required in FSR/E. Assess locations to host training and agencies to carry out training. CLIENTELE: Field-level FSR/E practitioners in Southeast Asia, FSDPEV practitioners. EXPECTED RESULTS: Training plans can be solidified for the FSDP-EV. secondary crops in FSR/E can be put forward. A draft trip report is on file with FSSP. IPB) and Thailand (Kasetsart University). EXPECTED RESULTS: Offer training expertise if AVRDC willing to pay for it. diagnostic and design phases of FSR/E together. Interact with SUAN representatives about common difficulties in implementing agroecosystems research projects. Propose a joint SUAN-West African university workshop for 1986.
in conducting agroecosystems research). EXPECTED RESULTS: A workshop (in August tentatively) at East-West Center, Hawaii, to discuss joint FSR/E agroecosystems research issues. A workshop in 1986 held in West Africa to involve SUAN representatives to discuss common problems in institutionalizing farm-level research and curricula at the university level. Systems staff and NERAD staff. EXPECTED RESULTS: Consensus on types of training, or materials, needed in Northeast Thailand. Reinforcement of intra-Asia IARC "network" on FSR/E. EXPECTED RESULTS: Better understanding of FSSP and what the program offers. especially in the Asian region. Better feeling for "pending Asian Activities" for rest of 1985 and for 1986. OBJECTIVE: Visit USAID/Nepal to discuss a possible workshop. EXPECTED RESULTS: Firm up tentative plans for a FSR/E workshop in Nepal. Suggest economic input for IADS into cropping pattern trials. referenced crop-livestock proj ects. EXPECTED RESULTS: Build a linkage between ARFSN crop-livestock research and the West African livestock research. begin to stress importance of Asian contribution to African FSR/E. CLIENTELE: Host country ARFSN members and key IRRI decision-makers. Direct feedback to FSSP on Asian needs in FSR/E for technical assistance, training or both. Develop sub-group of Asians interested in participating in African FSR/E workshops or TA activities. OBJECTIVE: Visit referenced projects and view economic accomplishments/problems. team (Dan Galt requested) Fall, 1985). CLIENTELE: Project team and Pakistan counterparts. assessment and/or training materials and/or persons for field-level practitioners. SPONSOR: USAID/I or USAID/T and FSSP. CLIENTELE: Host country FSR/E practitioners. EXPECTED RESULTS: Similar to Activity #1 ASIA (Philippines page 12). 1. diagnosis, 2. agronomic experimental design and analysis, 3. socio-economic analysis, 4. management and administration. RESOURCE PEOPLE: Individuals from: Colorado State University, Michigan State Univ., Univ. of Florida, Kansas State Univ., VPI, Washington State Univ., Univ. of Maryland, USAID-S&T, OICD-USDA, CIMMYT, IRRI, CARDI, Development Alternatives Inc., AGRIDEC, Synergy International. experience. Courses formed from the units can address a wide range of issues not exclusive to FSR/E. personnel, one in on-farm research methodology and the other in extension and research management as tests of the training units. Field use of the OFR methodology unit will be initiated in Gambia and follow in other training efforts. Field use of the management unit is not yet scheduled, but a potential workshop in Zambia may be its first use. USAID agricultural research and extension proj ects inclusive of the farming systems approach. Arkansas, Colorado State Univ., Michigan State Univ., Univ. of Illinois, Univ. of Florida.